Jackie Walters, a fellow realtor at Village Properties, recently wrote an article for the Santa Barbara News-Press recapping our 2012 real estate market. Her overall sentiment was that our market was much stronger at the close of 2012, leading us into a bright 2013. When looking at sales totals from over the past decade or so, a strong increase in the volume of sales can be noted for 2012. 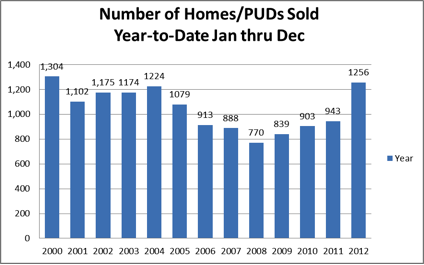 In fact, more homes and PUDs sold in 2012 than any other year since 2000. Sales were up 33% from 2011, even exceeding annual numbers during the height of the market in 2004-2005. The dollar volume for these sales was up nearly 55% from 2001, with over $1.7 billion residential real estate sales. Riskin Associates had a banner year, contributing over $220 million to that total. Inventory has dropped steadily over the past twelve months, with little over 300 homes for sale from Carpinteria to Goleta. With 3.9 months of inventory market-wide, this shows a solid seller's market. In December, properties were on the market for an average of 56 days, dropping steeply from 101 days in December 2011. High-end home sales, for properties priced over $5 million, increased almost 100% year-over-year. There were 25 such sales in 2011 compared with 48 in 2012. Many sellers adjusted their expectations on price, coinciding with a steady increase in buyers in the upper range. Meanwhile cash sales are up, as some investors find local real estate a stronger investment than financial markets. The Cheif Economist of the California Aossication of Realtors, Leslie Appleton-Young, described our current market as "a buying opportunity that comes around only once in a generation." What an exciting prospect!